"The Lynden companies believe in safety and it is one of our core values at Brown Line," says President Bill Johansen. The dock team, led by Dock Manager James Briscoe, just celebrated five years of working accident and injury free. The seven-member team moves all freight from around the yard, moving trailers and driving forklifts to unload and reload freight. "It takes communication, coordination and collaboration between each of the team members to make this happen," says Manager of Health, Safety, Security and Environment Bill Smith. Bill along with Bill Johansen and John Hillman presented each employee with a custom jacket, a plaque and a certificate commemorating this milestone. "We are very proud of this team and their accomplishments. They are all very humble and get the job done without incident. Their comment? 'Let's go for another five years and beyond!'" 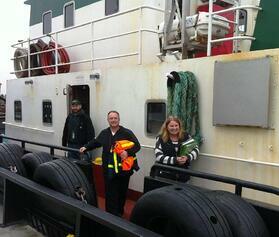 The Brown Line dock team. Top row, from left: Justin Johnson, James Briscoe, Jason Lawlor and James Buckingham. Front row, from left: Shane Hill, Don Treat and Jason Ronen. Not pictured Cory Eiler. 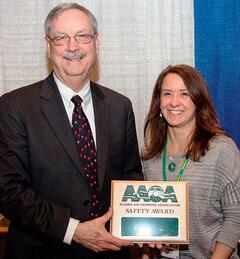 Michelle Fabry, Lynden Air Cargo’s Director of Safety, accepted the Alaska Air Carriers Association (AACA) Safety Award from Director John Duncan of the Federal Aviation Administration at the February award luncheon in Anchorage. With the 2015 award, Lynden has received 14 consecutive safety awards which are presented to incident and accident-free carriers each year. Also in February, Lynden Air Cargo received news that it is the only carrier in the nation to receive approval of its Safety Management System Implementation Plan (SMSIP) on first submission to the Federal Aviation Administration (FAA). The Implementation Plan details how Lynden will meet the FAA’s regulatory requirements. “We’ve been working on SMS Implementation for over three years. At the time of submittal, we showed that our plan was 80 percent complete with full implementation scheduled for the end of 2016,” Michelle explains. A team of department managers from operations, cargo services and maintenance worked together to develop the plan which included going through every FAA line item and detailing how Lynden would meet the requirement. According to Michelle, carriers who do not receive initial approval receive a visit from a team of FAA officials to help them finish the plan correctly. “This is a big deal for us. We have a great group here that got it right the first time.” Full implementation of the SMSIP is not required until 2018, so Lynden is not only ahead of schedule but setting the bar for other carriers. “This is a great accomplishment,” says Project Manager Walter Rakiewich, of the performance of Lynden Canada Co. employees. Lynden was selected from all of AMEC’s global business units as the recipient of a Beyond Zero Outstanding Achievement Award for incident-free work. “The award was presented by AMEC and its construction staging facility to honor Lynden for working more than 100,000 man hours without even a minor scratch or anything requiring first aid treatment,” Walter explains. 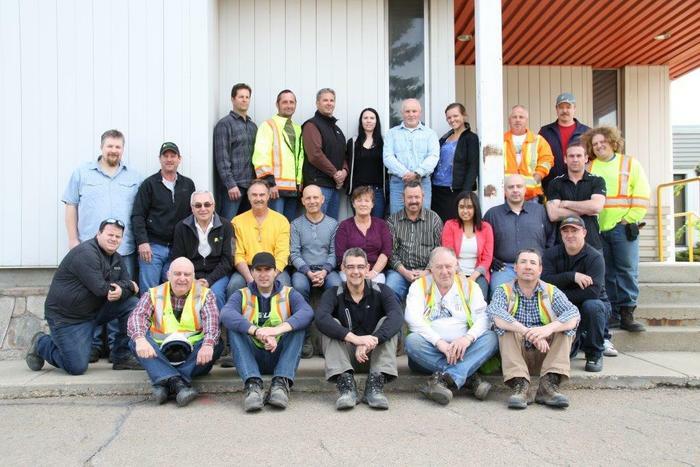 For the past three years, Lynden Canada Co. has been providing services to engineering firm AMEC at the Construction Staging Area (CSA) facility in Northern Alberta. AMEC is building the Kearl Oil Sands expansion plant for Imperial Oil/Exxon Mobil. Material is staged at the facility and shipped to the construction site as required. Lynden Canada Co. Administrative Assistant Candice Fox also received an award from AMEC. She was one of the first Lynden employees hired for the project. 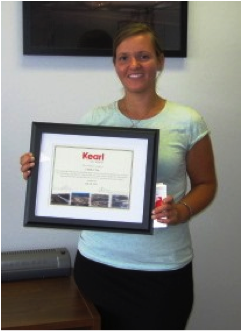 “Candice was nominated for this award by Kearl Project Director John Day,” Walter says. “I have personally worked with Candice and she certainly displays all the qualities the award stands for.” Candice (pictured above) was honored for exceptional dedication in providing support to the Construction Staging Area (CSA) and coordinating an award-winning CSA Safety Rodeo video and luncheon. Tags: Awards, Lynden employees, Safety, Lynden Canada Co.
Alaska West Express received the Alaska Safe Truck Fleet of the Year Award from the Alaska Trucking Association (ATA) at its annual awards banquet this spring. Alaska West Express was recognized for its safety performance in 2013, including accident frequency rates, compliance, safety and accountability (CSA) scores and OSHA recordable injuries. It also received three other safety awards from the ATA including Line Haul, Local Cartage and Line Haul Most Improved. The ATA sponsors the safety awards with ConocoPhillips to recognize and reward carriers who operate safely on the highway and in the workplace. CSA is a major safety measurement and reporting initiative of the Federal Motor Carrier Safety Administration (FMCSA). 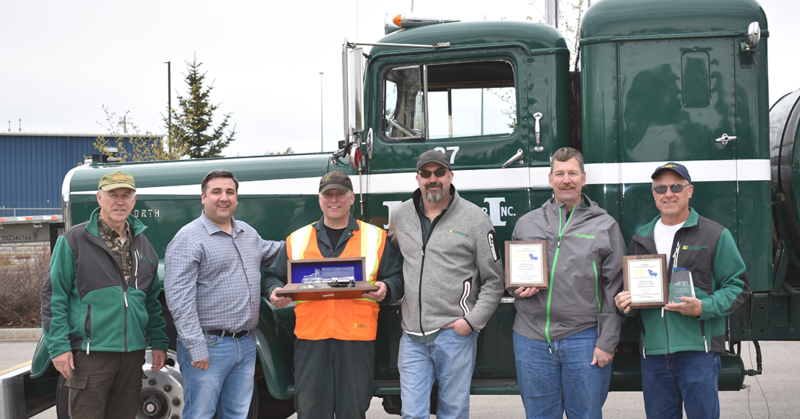 "This award represents the hard work, professionalism and integrity of our managers, operations team, drivers and mechanics," says Alaska West Express President Scott Hicks. "We haul a variety of commodities in very challenging conditions, including hazardous chemicals, petroleum products, dry bulk commodities and retail products. Safety is extremely important to us, and we appreciate that our efforts are recognized by the ATA and ConocoPhillips." 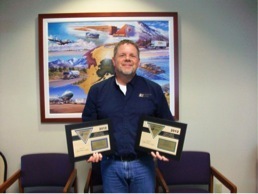 Brown Line Safety Director Bill Smith proudly displays the company's two award plaques for workplace safety issued by the American Trucking Association (ATA). The ATA's National Truck Safety Contest results were announced last month and Brown Line placed in two categories for the second year in a row. The Mount Vernon trucking company placed first in the general commodities LTL/local division, up to 10 million miles category, and took third place in the general commodities LTL/line-haul division, up to 10 million miles category. "We are up against much bigger trucking companies with hundreds of employees and trucks, so these awards are hard-won and extremely meaningful," Bill says. 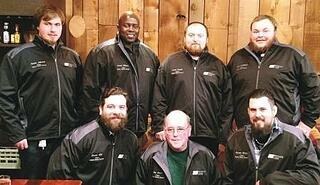 Congrats to the Brown Line team! 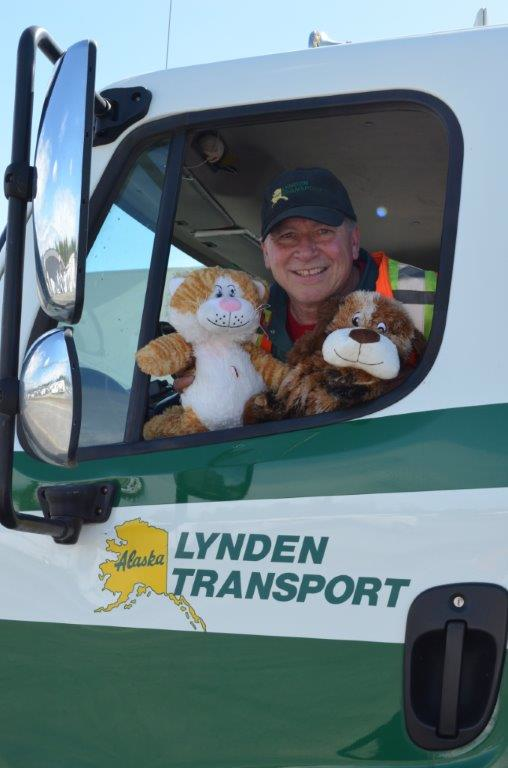 Lynden Transport recently donated the transportation of 3,000 stuffed animals from Alaska to the Lower 48. "A huge thank you to driver Ray Sorenson and Lynden Transport for helping Chance the puppy and Lucky the kitty making it from Alaska to the Lower 48," says Janette Fennell, founder and president of the KidsAndCars organization. 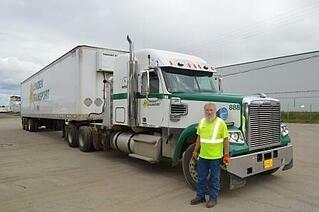 Lynden Transport donated the shipment as a contribution to KidsAndCars' Look Before You Lock program. The program educates new parents on how to keep their baby safe by putting a stuffed animal in their child's seat as a reminder not to leave children alone in vehicles. The toys are being used to demonstrate this important safety step and are being delivered to hospitals nationwide. Lynden Transport donated truck and steamship transportation to the Lynden warehouse in Fife for distribution to hospitals. "This has been an incredible team effort from wonderful companies with large hearts who care deeply for the safety and well-being of our children," says Janette.